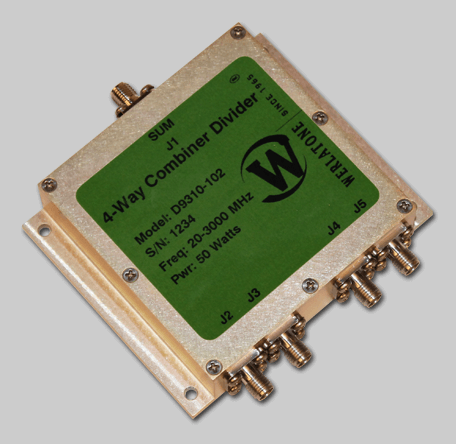 Werlatone's NEW Multi-Octave Combiner/Divider, covers the full 20-3000 MHz band, and is rated at 50 W CW. Model D9310 measures just 2.75 x 2.75 x 0.85", and is supplied with all SMA Female connectors. This compact design offers a minimum of 15 dB Isolation across the entire band, and is suitable for military and commercial applications. Werlatone’s NEW Multi-Octave Combiner/Divider, covers the full 20-3000 MHz band, and is rated at 50 W CW. Model D9310 measures just 2.75 x 2.75 x 0.85″, and is supplied with all SMA Female connectors. This compact design offers a minimum of 15 dB Isolation across the entire band, and is suitable for military and commercial applications.